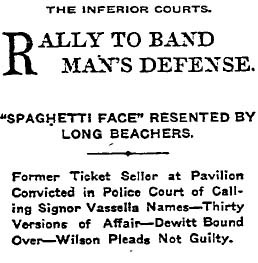 Marco Vessella, conductor of Long Beach’s Royal Italian Band, has had nothing but trouble with Special Officer W.D. Cason after firing him from his job as ticket taker. Vessella was an extremely popular and respected musician in Southern California. The Times said: “Vessella clings to no past traditions, is a follower of no particular school and is not an exclusive nationalist. He plays with equal facility representative compositions of French, German, Italian, English and the best American composers. Witnesses said Vessella fired Cason because he was flirting with the conductor’s women friends. 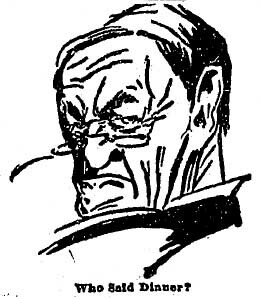 On the night of Sept. 10, 1907, Cason ran into Vessella and a young woman named Mabel Wilson at the Huntington station and began insulting the maestro. Asked in court to explain his comments, Cason merely shrugged. Cason was convicted and fined $15 ($307.85 USD 2005), but the animosity between the men wasn’t over. In October, Cason accused Vessella of challenging him to a fight. The jury deadlocked and the case was dismissed. Vessella left Southern California the next year. He did leave behind a recording of the “Pasadena March” and a number of other recordings.